Join us October 26th at 5PM for Octoberfest! 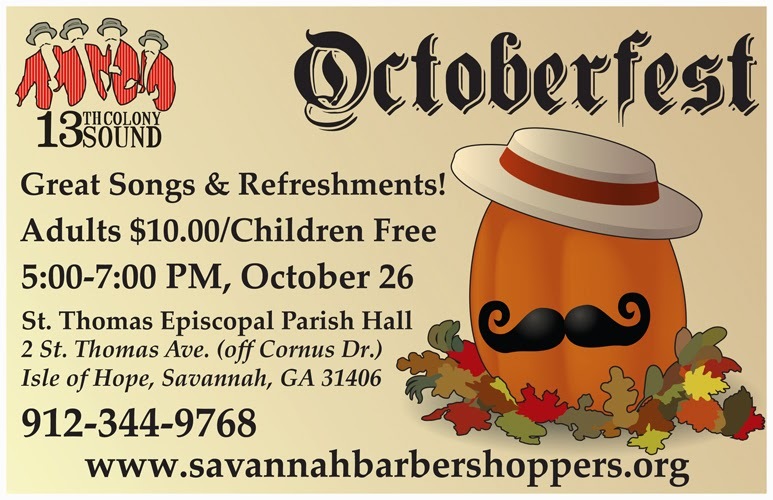 We'll celebrate fall with refreshments and songs sung in the good ol' barbershop style. Fun for the whole family! We'll see you there. 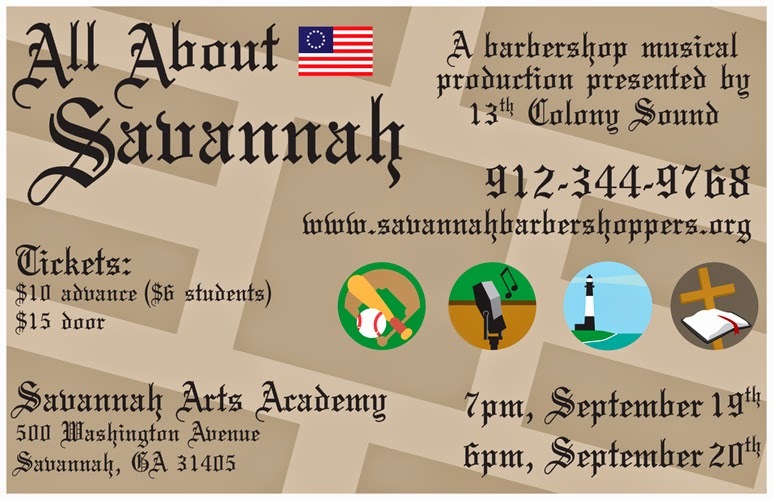 “All About Savannah” is a musical comedy highlighting the sights and places of Savannah. Exploring our beautiful parks, ballparks, restaurants and churches through song provides an entertaining evening of laughs and listening pleasure for the entire family. 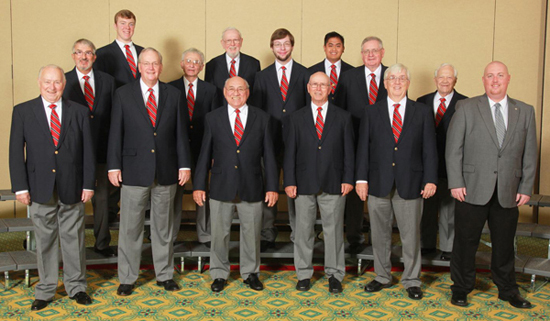 Presented by 13th Colony Sound, Savannah’s Barbershop Harmony Society Chorus also features select quartet performances as well as the Savannah Arts Academy “Skylarks” and Boys Quartet. 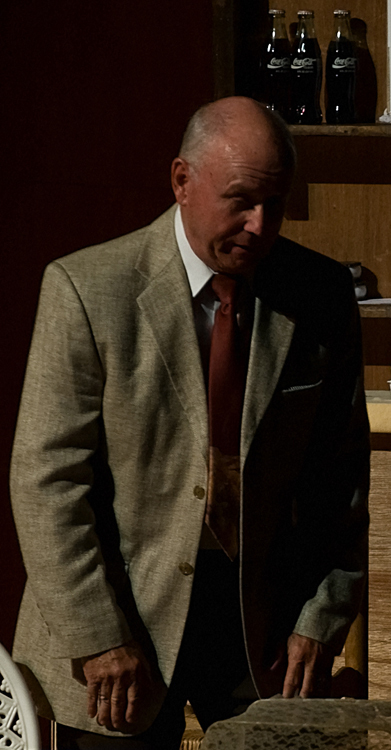 Presented on Friday, September 19th and Saturday, September 20th at the Savannah Arts Academy, 500 Washington Avenue, Savannah, GA. Curtain Time is 7:00 PM Friday, and 6:00 PM Saturday. Parking is free. Advance tickets are $10 for adults and $6 for students; tickets at the door will be $15 for adults and $10 for students. Tickets for military personnel, sponsored by community businesses, will be distributed at the Hunter AAF gymnasium. 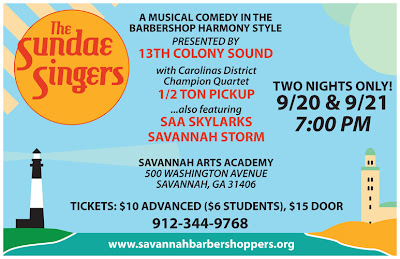 To reserve tickets please visit www.savannahbarbershoppers.org or call 912-344-9768. Recently, we bade a fond farewell to one of own. Spence Howell has been a long-time member of 13th Colony Sound and a beloved friend to each member of our group. He and his wife Claire are moving to Arizona to be closer to family. We will miss them both very, very much. We aren't just losing one unique character with Spence's departure—we're losing a bunch of them. Spence put his gifts to good use and created some of the most iconic characters in TCS show history. 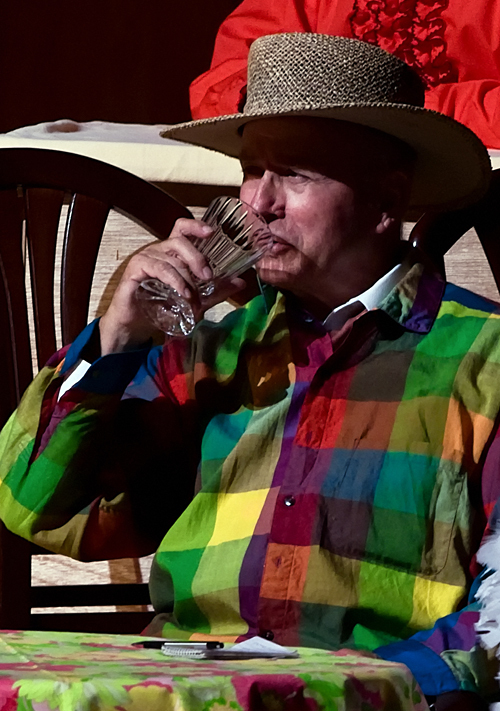 A considerable portion of his career was spent in South America, and he is fluent in at least 3 or 4 foreign languages. He drew on his experiences and his ethnic understanding to make memorable characters that ring like one of our barbershop chords. 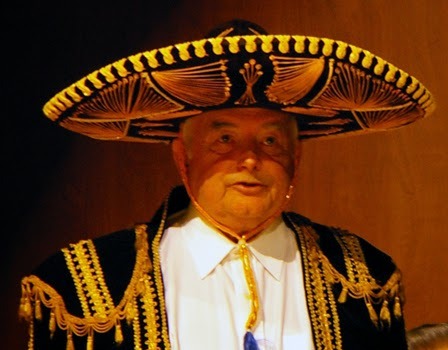 Who can forget this memorable member of the Tijuana Tacos, who sang “Mexicali Rose,” right before the sheriff demanded to see their green cards? And then there's the famous musicologist Dr. Omar Valentino, who can match any couple to their their perfect song. “Here, There, and Everywhere” is not a suitable song for love that lasts—no, no, no, try “Because of You” instead. Spence's wife Claire has also been a valuable part of our chorus. Not long ago, she served as our Valentine's coordinator and did a fantastic job on what is always an arduous undertaking. I don't believe she or her husband are capable of uninteresting conversation—no matter the topic. That's the definition of a classy couple. Things are already different here at 13th Colony Sound. We look forward to the time when we'll meet them again. Last week, TCS lost another one of its own. Carlton Wright passed away on Thursday, September 26th, 2013. Carlton was 87 and an active barbershopper for most of his life. 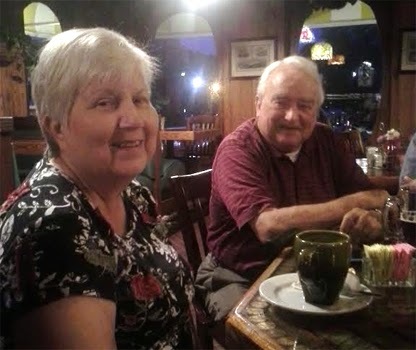 He was a member of TCS for over 30 years, making contributions to our chapter and our hobby that are no doubt still felt by the members of our chorus. Before Carlton came to Savannah, he made another significant contribution to the world of barbershop harmony. 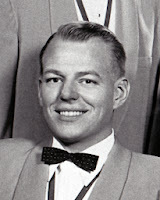 In 1957, the Lads of Enchantment quartet (with Carlton Wright as baritone) took the gold and became the 19th quartet to take the title of International Barbershop Champions. This tribute video to the Lads of the Enchantment will tell you more than I can. It will also give you the chance to listen to this quartet and the baritone who will be sorely missed by all of us here in Savannah. I think that just about says it all. Carl will be missed, even by those like me who never met him. His legacy lives on, and all the spontaneous renditions of “Love Me And the World is Mine” that echoed throughout our weekly practice last night reflects the impact he had on those blessed enough to have sung with him. All our love from Savannah and heartfelt condolences to his family. Rest in Peace, Carlton Wright. 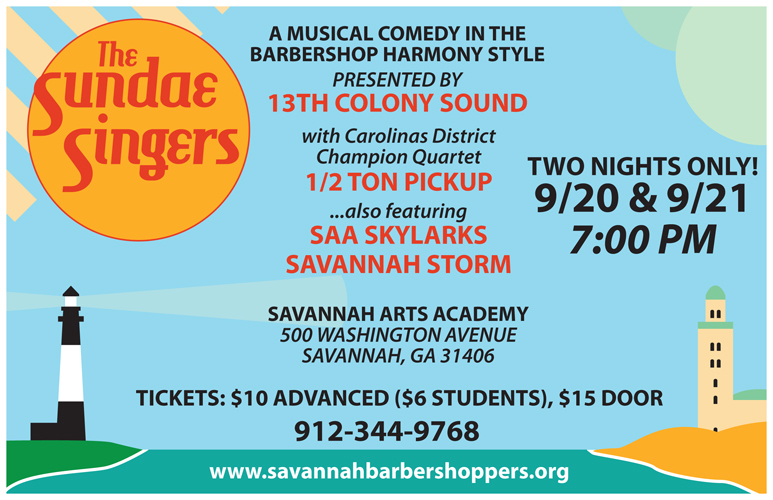 13th Colony Sound, Savannah’s Barbershop Harmony Society Chorus, presents a musical comedy “The Sundae Singers” on Friday and Saturday, September 20 and 21, 2013, at Savannah Arts Academy, 500 Washington Avenue, Savannah, GA. Curtain time is 7:00 PM. 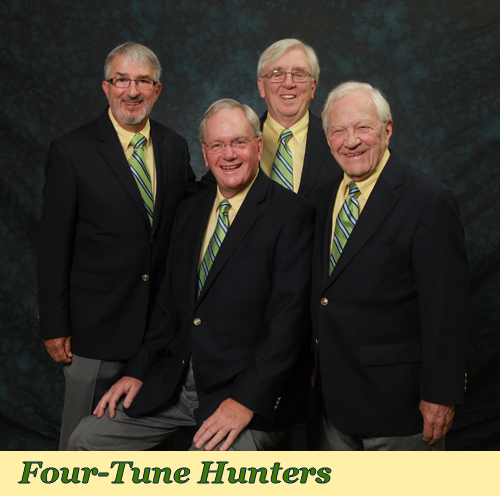 Four Quartet, and Carolinas District Championship Quartet: ½-Ton Pickup. Johnny, a young Tybee businessman, recruits a curious group of locals known as The Sundae Singers who draw customers to his ice cream shoppe. Unlucky in love and lured by his franchisor to think global, Johnny submits an application to sell ice cream in Ireland – only to wind up in a barren land where the outlook for his franchise is bleaker than the landscape. Before long Johnny finds a nomadic group of singers to promote his ice cream while they keep peace throughout the land. But Johnny may have been running from love, which pursues him even to the edge of the desert. “The Sundae Singers” will provide an entertaining evening of songs and laughs for the entire family. Advance tickets are $10 for adults and $6 for students; tickets at the door will be $15 for adults, $10 for students. Military personnel tickets, sponsored by community businesses, will be distributed at the Hunter AAF gymnasium. To reserve tickets please visit the Savannah Arts Academy website box office portal, visit savannahbarbershoppers.org or call 912-344-9768. We have a lot of very unique characters in our chorus, not the least of which is good ol' Richie Towns. Part Chuck Norris, part Gomer Pyle, this born and raised Savannah native decided to go career military....in none other than the Green Beret. 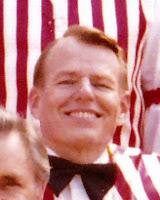 Richie's laid back attitude and easy-going nature is a constant in the universe of Savannah barbershop singing. He's so gentle and fun-loving, you'd never guess he's probably waged war in countries we're still not allowed to know exist. I roomed with Richie once at a barbershop convention. He's a very peculiar roommate to have—as long as the room is better than a ditch in a war zone during a hurricane, Richie is completely content. “It's better than spending the night in the Thunderbolt Jail.” That's Richie's response to just about everything in life. Everything. That shows the kind of impact he has on those around him. Richie is a bass, and one of the few charter members of 13th Colony Sound still around. His most famous role in our chapter meetings these days is the weekly raffle. At the end of break, tickets are drawn from the hat, and the winners are given some rather unique prizes, courtesy of Richie Towns. Typical prizes include: antique calendars, autographed books (signed “Richie Towns”), the occasional CD, and—if all else fails—a used pen. Richie also has a passion for Haiti. He was there when the earthquake hit a few years ago. He's gone back on several mission trips to help rebuild. 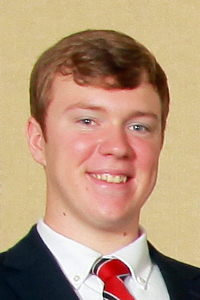 Thanks to his influence, another 13th Colony member recently took a mission trip there. Haiti is a better place now, thanks to Richie's efforts, the efforts of those who go with him, and the efforts of those who are inspired by them. So on this Memorial Day, we'd like to not only remember those who served our nation, not only remember those who never came home, but also note the continuing contributions those who did come home have made since then, continuing to serve our nation—and even the nations around us—for the entire duration of life, whether in or out of the military. And for this purpose, it's hard to find a better chorus-member to pick on than our "Bonna Bella Richard," Mr. Richie Towns. A few weeks ago, the Carolinas District met for it's fall convention in the beautiful Myrtle Beach. It may go down in history as the first of our district's conventions to be attended by a late season hurricane (Thanks, Sandy!). It also goes down in our Thirteenth Colony Sound history as well. For the first time in at least 15-20 years, men from the Savannah chorus took to the risers to compete in a district chorus competition. We received a score we're very happy with, received countless complements regarding our performance, got valuable feedback from the judges, and enjoyed every minute of it. We're putting Savannah back on the map, folks. We also were well represented in the quartet competition with members in the senior quartet Vintage Four and 1/2 Ton Pickup--this year's district champion. We also had a senior quartet made up entirely of Savannah barbershoppers. Four-Tune Hunters (formerly known as Whatever Four) entertained us all with their creative and witty selections. We couldn't be prouder to see this show quartet transform and evolve to the point of performing on the contest stage. Traveling North in a teal minivan to Myrtle Beach, South Carolina from Savannah, Georgia to attend the 2012 Fall Carolinas District Barbershop Convention, I anticipated deeply my first district gathering. My hopes actually underestimated the grandeur of my new experience, for brilliance from the talent of the quartets and of the choruses had illuminated the dimly lit house of my temporal lobes. Although witnessing such profound talent is solely surpassed by the welcoming warmth from the courteous Carolina District dabblers and practical professionals which will follow me and remind me how jointly jubilant the chapters we met were toward our presence and toward our participation. Singing gutsy tags, attempting new arrangements, and honing my skills in new venues, with young members, and to rare audiences are what I wanted to grasp, and since I have done these, the conception of the true feeling of what it means to be a bona-fide Barbershopper begins in me. And perhaps, through consistency and nurturing, this feeling will mature into a tangible tool that may be exercised to help lead a new generation that preserves our art into fruition, so that the worry of the entrance of Barbershop Harmony into some state of subterfuge will be a dream. These are my reflections heading South in teal minivan. 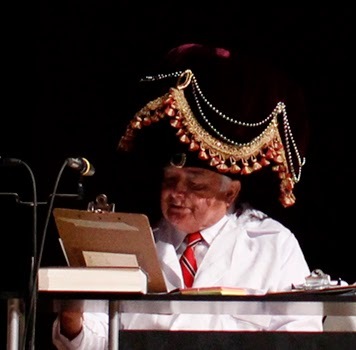 If you have yet to experience the joys of a barbershop convention, don't delay! There's another convention in the springtime, and we have a chorus right here in Savannah to help you get prepared for the awesome experience that awaits you. Please give thoughtful consideration and join us. We look forward to having you.